A few years ago after an Iboga plant medicine journey I had the inspiration to engage in Dance. Something I hadn’t really done since the 90’s during my time in the Rave scene. I’m not a great dancer but I loved the music and was also then a Music Producer running my own Techno band. Happy times, filled with much enjoyment and inspiration. I returned then to this aspect of my life after the experience of Iboga. And had the feeling to join a Dance group but to engage in this more consciously in relation to the experience of bodily and emotional awareness. Dancing for fun but also for good health in body, mind and spirit. I couldn’t find anywhere in Glasgow that catered for my felt desire. There were some movement meditation Dance groups but I wanted something more fitting to my love and experience of electronic dance music. And something that wasn’t so seriously wound up in any particular dance methodology. The first night was great. More than 10 people showed up to Dance Creative, and we had a great time. Most people loved it and felt really inspired by it. I did too. The Dance Creative events continued fortnightly and I become more comfortable in hosting them. They started off very basic. And sometimes we even had just 3 or 4 people attending. One time only myself and two others. I remember that night very well, and I was so grateful for these people to show up and dance with me. We had a good time. However I had this vision and inspiration to create something bigger, more expansive, inspiring and enjoyable for people. But I was torn because the dances weren’t achieving the level of attendance I felt they really should be. How can people not feel or see how good this is? Is the question that was going through my mind. I knew how good I felt about them and wanted to share with people in that. I thought to give up but just couldn’t somehow. Eventually after some changes in location and assistance from a couple of my besties the new nights took off. And we started our Conscious Dance events in the centre of Glasgow. Awesome sauce. They were great fun and inspiring, the energy was buzzing and most people who attended loved it. The feedback was always good, and many new connections were made. Something was definitely stirring and growing here. I could feel it. We all could feel it. I received supporting input from some other amazing people who helped me expand the dances into a fully transformational and enjoyable event. We hosted them month to month offering Raw Cacao, Yoga, Sound Healing, and Live Music. All good stuff. And great value for people too. I knew I had to continue with this inspiration as I saw the effect it was having on people. People were really coming out their comfort zones, dancing and connecting in with the wider group involved. There was a lot of love and energy exchange. The initial feeling that I had within me to create these dances was expanding and multiplying 100 fold. Much more than I ever thought. The dances had a life of their own. And it was great to be a part of it. We also took them into Edinburgh and made some amazing connection with even more people. The Conscious Dance vibe was spreading. We didn’t and don’t take ourselves seriously at all. It’s been a party all along. Free flow, freestyle, free participation from anyone who feels inspired to give their gifts into the mix. All good stuff. Both Glasgow and Edinburgh was jumping, many reveling in the inspiration of Conscious Dance. Creating and making it our own. I was always inspired by the people who showed up. I learned so much about giving and receiving, and of how when all our inspirations come together we can create something really beautiful and worthwhile. Powerful even. Transformational. The Dance journey continued and more and more inspiration was coming to me about how things could expand. I wanted to get the Dance vibe out to as many people as possible because I just knew that they would enjoy it. Most people anyway. Some people got a bit put off with the choice music and neon razzmatazz that we incorporated into our events. But that’s fine it’s not for everyone. There seems to be a certain energy that’s evoked and transferred within the dances. Some people vibe with it, other people don’t. It’s just the way of life. I knew I had to help these dances expand and I had visions of creating larger Conscious Dance events. Expanding them beyond just smallish dance meditation groups to larger events where more people could just dance freely and enjoy. Anyone, not just Spiritual people. I always had an aversion to making them Spiritual. I felt that a bit stifling and boring. Anyway, I learned to DJ and started DJ’ing at the dances. One because I knew that having a DJ would add a different dynamic to the events that suited where I wanted them to go. And two because I knew and had a feeling for the music I wanted to play. It was like an energetic transfer. The music I selected based on a certain energetic feeling. And this energetic feeling would expand during the night. We’d become immersed in it. And the feeling was good. Transformational. Wholesomely beneficial, and enjoyable. Don’t ask me to explain. It’s just a feeling. As there was so much love in Glasgiow, and so much love in Edinburgh I felt that our Glasgow and Edinburgh people would really love to meet and experience each other. To expand the vibe and family of Conscious Dance. So me and my good friend put things into practical action and organised our recent Stirling event. A location as central as we could find for both Glasgow and Edinburgh to come together. And of course to invite others too from Stirling, Falkirk, and other areas and cities. It was a great night. We organised things very well making it easy and comfortable for everyone who came. The energy was awesome, the music was amazing. A really deep and engaging sound journey that was also very lively and fun. It was the best mix I had ever performed as DJ. And I feel so much more settled in my work there. And also cannot wait for the next night to play again. We have since brought flower to a new inspiration we’ve called Sober Clubbing. Taking Conscious Dance into the Nightclub. 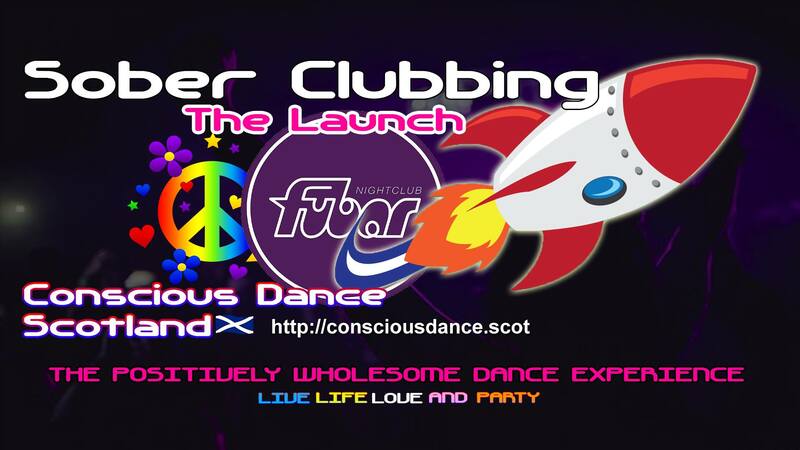 We have teamed up with the Fubar Nightclub in Stirling to bring these Sober Clubbing events to Scotland. For all people and interest groups to participate. We have learned a lot about how to organise and facilitate these Conscious Dance events and have got our act together well enough to provide a good time for everyone who enjoys them. Sober Clubbing is our next phase in the journey. Bringing the Conscious Dance vibe further into Scotland, touching as many people as possible who are interested and want to dance. You’re welcome to find out more and to participate. Everyone is welcome, age 18+ and of any interest. It’s a celebration. A celebration of life and of ourselves. A crowd of people having great fun, enjoying the music and each other. What could be better for a night out? One of which you will return home sober, and inspired in your own life. Inspired perhaps to create, get lively, and make things happen for yourself and other people whom you love.